The American Action Forum analyzed the government’s routine regulatory adjustment to the food stamp program this month, finding that Americans will have to spend 93 million more hours doing paperwork to comply with the program. "Every week, the White House approves dozens of paperwork and reporting requirements," wrote Sam Batkins, the director of regulatory policy at the American Action Forum, in a report released Wednesday. "Many of them go unnoticed by the public and the vast majority are routine." "However, the burdens in the latest food stamp approval are profound: 14.6 million Americans will provide 658 million responses to the Department of Agriculture (Ag) annually, and it will cost households, states, and local governments $958 million to comply," the report said. "The burden specific to the federal government is $356 million." 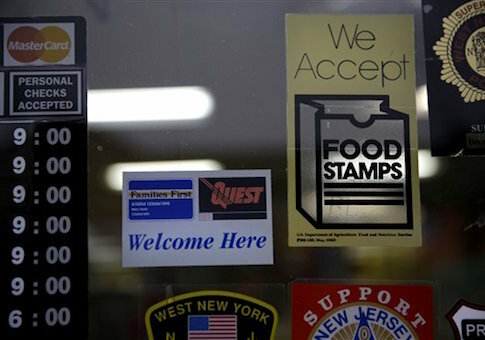 The government said the regulatory burden is necessary due to the high number of Americans on food stamps. The number of food stamp recipients recently dipped below 45 million for the first time in four-and-a-half years. "According to the administration, ‘The number of SNAP participants has increased. We have updated the household data to the most recent available information … to calculate a burden that is based on the most current program participation levels,’" the report said. "This readjustment has led to the reality that the fiscal imposition of the $74 billion program exceeds $1 billion in regulatory costs annually," the report added. The U.S. Department of Agriculture reported the regulatory change would cost nothing in its submission to the Office of Management and Budget. However, "buried on pages 14 and 15" in the supporting statement announcing the change the agency said the change would cost the federal government $356 million and add 93 million of paperwork. The total costs related to approving food stamps can now "easily exceed $1 billion and 118 million hours" each year. "To put this into perspective, it would take 59,110 employees working full-time (2,000 hours annually) to comply with the required paperwork," the American Action Forum said. "In addition, this SNAP program is now 53 percent of Ag’s aggregate paperwork burden. One program alone is now the majority of the agency’s regulatory burden."